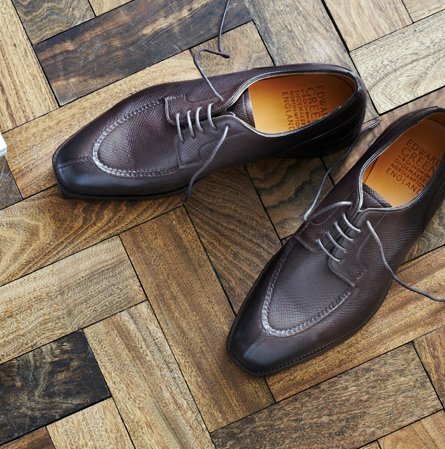 Simple, neat and unfussy - the cap toe oxford is often at the heart of a man’s shoe collection. It’s both a smart and versatile choice of shoe. The Chelsea is our most popular model, distinguished by the elegant swan’s neck detail stitched into its facing. A shoe’s character is very much shaped by the last it’s made on and we make the Chelsea on both the classic, rounded 202 last and the more oval 82. So it seemed natural to make the Chelsea on our new 915 last, bringing a contemporary appeal to this most classic of designs. The 915 has a more tapered toe that the ever popular 82, more centrally balanced, and whilst subtle the effect is a shoe which is noticeably more modern and sartorial. Like all our 915 models, the Chelsea has flat laces which complement the sophisticated look of the last. The 915 Chelsea is available in black, dark oak and nightshade antique calf.